Why did you agree to speak with me? C: Well I thought it would help remove some of the stigma. Oh well yeah..thank you! So many women email me and they are afraid to join even my secret group because they don’t want anyone to know. Thank you for doing it! C: I wasn’t diagnosed until I was about mid 30’s? going back and looking at my childhood it made so much sense. I was diagnosed before I had my second child, and he is just like me with depression/anxiety/ADHD. Knowing what I know now it is helping me parent him better than I was parented. Growing up I reacted to things…and seeing it in my son. It made sense, the hyperfocus – you can march a parade past me and I wouldn’t see it. Did you have physical hyperactivity – people still associate ADHD with boys and hyperactivity? C: I’m not sure. When I was young you went outside and played and didn’t come back until the sun went down! <laughs> I know I was fidgety but that is all I can think of. C: In high school yes, in grade school it was not an issue. I got lazy with high school and expected it to be easy and I didn’t want to do the work. I couldn’t force myself to do it, I barely graduated. That happens a lot with girls because nobody thinks anything of it until you get older and all of those executive function skills come into play. Then we fall apart. Even then it often goes unnoticed in girls. C: I went through anger toward my mother a lot, because anytime I was taken to counseling as a kid the counselor would bring her into it – she was flaky and had trouble maintaining the therapy. I think she probably has ADHD as well. I had to accept some things about my mom and myself. What do you think ADHD is influencing your life now? C: Mostly – if you saw my space, my living room it’s obvious. I am an all or nothing person so if I cannot clean everything I don’t bother starting. I don’t like mess but I can’t get started and then my anxiety starts increasing. My house is disgusting, in my opinion. Anywhere there is a flat surface there is clutter. The truth about ADHD and clutter. Do you think EF wise, does it affect anything else? Motivation? C: Both. When I try to plan it out and think through it, my anxiety takes over and I build it up in my head. Seeing the big picture is overwhelming, and I can give myself an anxiety attack. My husband deals with me, he is the kindest person in the world. But now that I am starting to understand why this is happening, he is helping me. He tries very hard to be supportive. How about emotional stuff? Is there a connection? C: I think ADHD fuels the anxiety and the depression comes from trauma and not being able to deal with all of it. My coping mechanism is basically eating my feelings. Not the best. What role has anxiety played in your adult life? C: It’s been a huge deal. Socially I struggle, even trying to restaurants and places. Big gatherings are not good unless I have a close friend with me. I just signed up for PTA for next year so we will see how that goes. I gave it up once before to focus on my family. C: I need more tools. I have tried bullet journals. And I am always disappointed and not satisfied with how it turns out so I am anxious to try again. It’s ridiculous but when it’s happening it’s hard to stop it. C: I work part time. I am home to pick up from school. My day is mostly organized around work. When I come home it depends on what is happening that afternoon. The calendar on my phone has helped to remind me of appointments. I even schedule in hanging out with my friend, because if it’s not there I will forget. C: Making lists does not work. I lose the lists. Trying to remember things doesn’t work. I can follow a schedule but when other people don’t it irritates me. Everyone has to do the same thing I am doing or I am thrown off. I had to let my husband do laundry without criticizing because he is trying to help. I am trying to stop myself from controlling some things. I am trying to do creative things to help myself. Now I paint rocks! I joined a group and we can do it together. I feel like I can be satisfied with something. 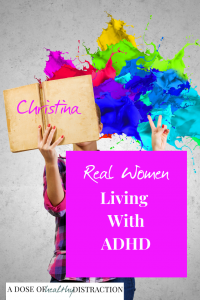 Is ADHD a negative or just part of your life? C: Having to struggle is a negative, not being able to remember anything! That is the tough part for me. Did they recommend anything when you were diagnosed? C: I cannot afford a counselor right now. They had me on Straterra for a while, but I felt more anxiety, so I went off it. I take Intuniv now at bedtime. I cannot take stimulants because of my blood pressure. If you were giving advice what would you say? C: I think having a schedule and routines is a big help. Knowing that I have the same thing to do every day is helpful. Staying in the routine is the hard part. How could you help yourself do that? C: Reminders everywhere. On my phone, everywhere! Sit down, put it in the phone, map it out! We know what needs to happen, the problem is in performance! What do you think was the theme of our conversation today? C: Stay positive. Don’t look at it negatively, hyperfocus on the negative is not going to help. I am not the only one who feels this way, people need to talk about it. We spend too much time comparing ourselves to others, it is certainly not productive. Join my email list – I try to be inspirational, informational…and FUN.